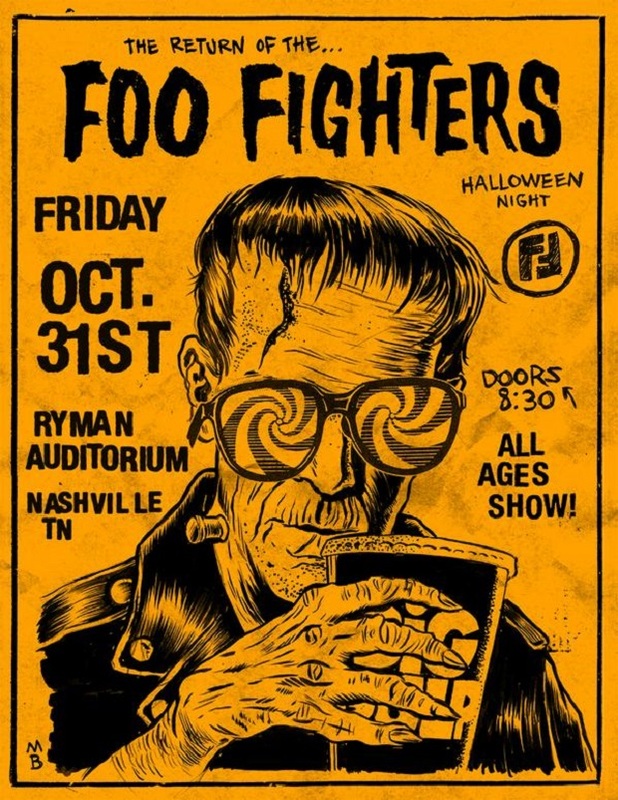 Foo Detective :: Foo Fighters To Play Nashville on Halloween! Foo Fighters confirmed their show at The Ryman this morning. Tickets go on sale on Wednesday October 29th at 10am CST, and, amazingly, will only cost $20 per person! Start refreshing here at 9:30am CST for even the slimmest of chances to make the cut! Tickets are available ONLINE ONLY! Show poster below, and then you can keep reading to see our speculation about this starting last week! Yes, this is a speculation post, and not an actual confirmed news post, but hear us out before you angrily slam your laptop closed. There is solid reason to believe that the Foo Fighters will make a Music City appearance on Halloween (or at least Halloween weekend), and why the Mother Church may be the most appropriate location. So, by now, most of you Foo fans are well aware that the Foos are releasing their eighth studio album, Sonic Highways, in November, and the same lot of you probably spent last weekend glued to your TV trying to catch the documentary series of the same name on HBO. The series documents the making of the album which was uniquely recorded in several American musical landmark cities, including Chicago, Washington DC, Los Angeles, Seattle, New York, New Orleans, Austin, and… of course, Nashville. The Foos announced last Tuesday that the series premiere of Sonic Highways would highlight their recording experience in Chicago and would be followed by a show at the Cubby Bear, a small, 800-capacity club where David Grohl saw his first concert back in 1983. Tickets for the show went on sale Wednesday and ‘Something From Nothing,’ the first single from the new album and the song recorded in Chicago at Electrical Audio, was released on Thursday. The next episode of the series is set to air this Friday and will highlight their time in Washington, DC, which is where ‘The Feast and the Famine,’ the second track on the album, was recorded. Earlier today the band announced a show at the Black Cat, a 700-cap club in Washington DC, with tickets going on sale tonight that can only be purchased at the box office. Based on the information above, it’s safe to assume that the Foo Fighters will play a show in Nashville at some point. And if you’re like us, you’re probably already having a panic attack trying to figure out the details by stalking their social media pages 10-15 times a day looking for clues, overanalyzing every tweet and Facebook post. You start sweating when you imagine what it would be like to attend this historic (and possibly imaginary) event. You have nightmares about having to refresh the Ticketmaster page over and over again only to find that you didn’t get tickets in time. Ok, we’re the only ones those things, but that’s not the point. So now let’s get to the fun part. If there is a possibility of the Foos coming to Nashville, we need to figure out when and where so we can stay on top of our game. The first episode of Sonic Highways took place in Chicago, which is where “Something From Nothing” was recorded. This song also happens to be the first track on the album. The second track is called ‘The Feast and the Famine,” which was recorded at Inner Ear Studios in Arlington, VA, which is about 20 minutes from Washington, DC, which is where this week’s episode takes place. So if we follow this pattern, next week’s episode will take place in Nashville, where the third track ‘Congregation’ was recorded at Southern Ground Studios. That could mean the show will be on Friday, October 31. Can you think of anything cooler than seeing the Foo Fighters on Halloween? We sure as hell can’t. The only venue in town that is currently not publicly booked is the Ryman, and what could be more of a historical musical landmark than the Mother Church. Throw in the fact that the title of the song recorded in Nashville is “Congregation”, and the evidence seems overwhelming. Both shows so far have been announced around noon on the Tuesday before via social media, and have put tickets on sale the same day or the very next day. The best thing to do is to start checking their Facebook and Twitter next Tuesday (10/28) for the big reveal (if there is one…), and, of course, we’ll be sure to let you know all the deets here on the site (once we have secured our own tickets, of course). This is solid logic. However, their gig at VooDoo on 11/2 makes me think they might do the NOLA episode/show on Halloween. It does make sense, but so far they are running in the order of the tracks of the album. Not to mention, Voodoo Fest probably has a radius clause. Can’t imagine the festival promoters standing idly by while the Foos upstage Friday night of the festival in New Orleans. We’ll see though. I can definitely see it going either way. Great job on the sleuthing. “congregation”. The “mother church”. It’s a no brainier. Keep in mind that they are no strangers to jet setting. They played DC Friday and today, Sunday, they are in vegas. Nashville is deffo next and this is a great analysis! Shhh…stop telling people. Take it down! Lol…I’m only sorta kidding. What about The End? Yes it does say that Jesco White is playing that night, but it also says there is a Special Guests that night. I think the strongest possibility is The End. I think the Ryman is a good choice, i had this idea in the back of my mind when he was at the BlueBird that they might come back and do a big show. The Ryman I think is Nashville as you can get for doing something historic to bring the thing full circle. The End idea would be nice but they might just show up there afterwards. I don’t know if it means anything, but it looks like the Foo Fighters most recent follow on twitter is @theryman. It sounds like their marketing team is getting set up for a big announcement. I don’t think there’s any doubt Nashville is next with the Ryman being the likely venue. In addition to the excellent detective work in this article here are some other things to keep in mind; if you caught the recent 60 Minutes interview with Dave Grohl he excitedly shares his revelation that “church” is the main influence for country music. The Nashville song on the album is called “Congregation” and, of course, we all know the Ryman is the “mother church”. It’s also completely open on Friday night. The reason why fans are being thrown off course by assuming it will be a club show is because the Foos have played small clubs the first two shows so far. This is because those clubs either had special meanings to the band or was a venue they played early on. Most of the venues they’ve played in Nashville are either gone or booked. They’ve never played the Ryman. And I don’t care what band you are or how big you are, playing the Ryman is an experience and something you want to do. Sure it’s no 800 seater but it’s still small compared to the stadiums the band has started booking next year (Wrigley, RFK possibly). As a matter of fact, when they return to Nashville (and I bet they will next year), it could be somewhere like LP field. So, the real trick or treat on Halloween will be whether or not the Foos take the stage at the Ryman given so many strong clues pointing in that direction. Agreed. LP or Bridgestone… Our only question left is what time will the event be, and how will we get tickets! As for the time of the show…it seems they play the episode at the venue for fans to see (they did for Chicago, can’t confirm DC), then follow-up with the live show. So, I could see doors at 9pm, episode airs at 10pm then the show at 11pm. Next question, how long can they play at the Ryman, what is curfew? In Chicago they played as long as possible and had to keep an eye on the clock. Also, how will the tickets be handled? In person? Ticketmaster? 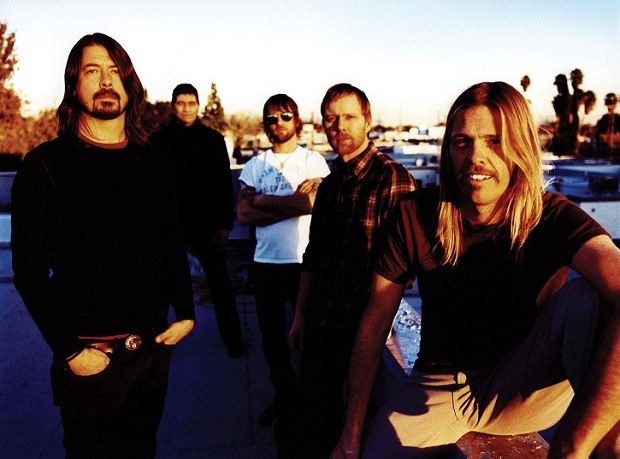 And a more fun, less nerve wracking question is – since it’s Halloween, will the Foos be in costume? One recent year they dressed up like Cheap Trick. I could see Taylor dressed up like Dolly or something crazy… if it happens, a highly rare, fun event that would tie together music, history and Nashville in a way we’ve never experienced before. It’s on! Check the Foos Twitter! Honestly, I hope it’s not the Ryman. I don’t see how a good rock show can be put on there. I guess they could do a softer set, I want to be pressed up against a small stage with the Foos inches from the crowd. The event at the Cannery complex will use all three venues, and we have an inside scoop that it is not going to be at on Cannery Row. The Ryman has the date set aside for a “private event”, which employees are not supposed to share nor discuss. I think it’s happening. What time is the Ryman’s curfew though? Sonic Highways ends at 11pm. They’ve been playing after it airs. Looks like it is the Ryman!